For those who are really in a rush. 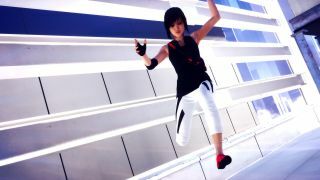 Mirror's Edge Catalyst will be scampering across rooftops on June 7, a slight, and slightly last-minute, delay over the original May 26 launch date that we learned about in April. But Origin Access members will be able to leap into it a full five days earlier than that, without paying up front—with one or two restrictions. Catalyst will be playable on June 2 as one of the “Play First Trials” on Origin Access, and if you dig the experience and spring for the full game, your progress will carry over. But playtime will be limited to six hours, with ten missions and two districts to explore. That's kind of an unusual number, and a good bit less than the ten hours of free play offered by the other Access trials, Need for Speed and Plants vs. Zombies: Garden Warfare 2. The safe assumption is that much more than that would be enough to finish the single-player campaign, and that's probably a little too much of a freebie for EA's liking. Not that it's actually free, of course. Origin Access is a subscription-based service that will set you back $5 per month. On the other hand, subscribers get ten percent off the $60 purchase price, which is actually more than a single month's fee—and as the terms of service say, you can cancel your subscription at any time. Do with that information as you see fit.